I’ve always loved this plant and have written about it in previous posts. It’s easy care: likes good, indirect light; flowers for long periods, then takes a rest; opens in daylight and closes up at night; likes moist, non-soggy soil and its leaves collapse (but plant doesn’t die) to tell you when it’s too dry and needs immediate watering. How user-friendly is that? The fact that it opens and closes makes it fun to watch and a good gift…especially for those who are homebound or in care facilities. That said, I–being neither homebound nor in a care facility–find this a wonderful plant. To be perfectly honest, picking off the dead flowers is the only part of having this plant that isn’t wonderful and admittedly that’s very picky (excuse pun). If left alone the stem dries up and a little tug removes dried stem and flower. Since flowers don’t look so good dried out, I’m always cutting the stems off after the they bloom. That said, cutting off dead flowers is a personal choice.. In the meantime, think about adding a shamrock plant to an aging parent’s life. It’s another way to lift spirits. For elderly non-plant lovers whose digestive systems permit, there’s always corned beef and cabbage and special draft beers (some green). Check out these New York ideas. Fun times may be few and far between for the elderly. St. Patrick’s Day offers another chance to lift spirits and that helps parents age well. 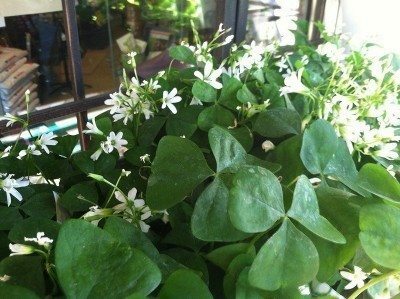 This entry was posted in Aging parents, Gifts and tagged A Shamrock Plant gift for elders on St. Patrick's Day, Oxalis regnellii, St. Patrick's Day gift for aging parents, St. Patrick's Day gift for hospitalize elders, St. Patrick's Day gift for nursing home patients. Bookmark the permalink. I agree that the elderly should take every opportunity to celebrate—and what better celebration than St. Patrick’s Day! Good for you for making that happen.